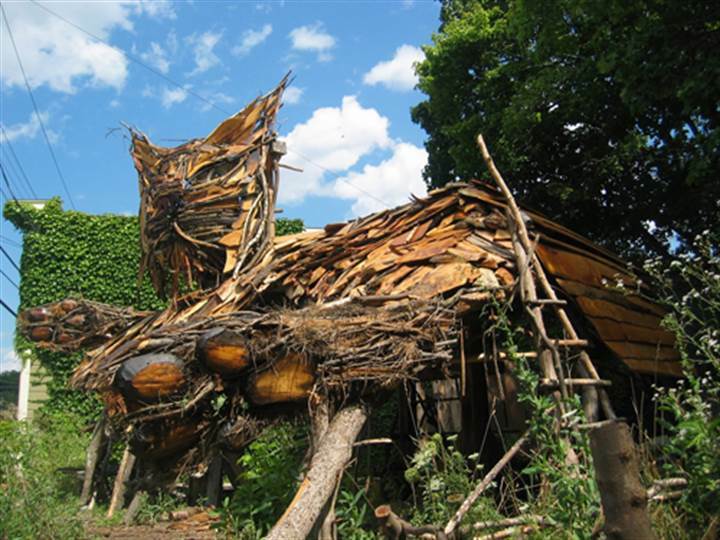 MATT BUA/CRIBS TO CRIBBAGE TO B-HOME AGAIN.... http://www.bobcathouse.blogspot.com A handmade People's Museum has been constructed in Catskill, NY in the form of a lounging bobcat. The museum is built using discarded tree branches and cut offs from local mills. The interior houses a collection of materials and displays celebrating the people, stories and history of the Catskill Mountains. Content for displays are collected from both historical organizations and the surrounding community. The museum has a unique focus of seamlessly blending the stories, visions and personal collections of residents with the voices of historians. The folk legends, urban myths and favorite, almost forgotten tide bits on display make this new public space a place to soak in what this area is really all about.